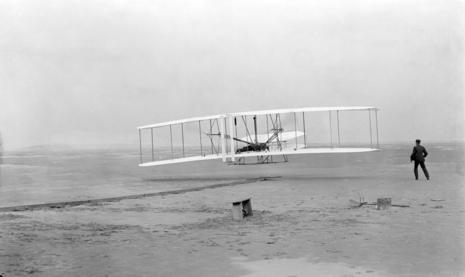 On December 17, 1903, two brothers from Dayton, Ohio, named Wilbur and Orville Wright, were successful in flying an airplane they built. 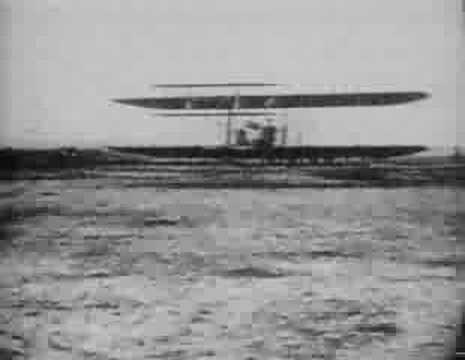 Their powered aircraft flew for 12 seconds above the sand dunes of Kitty Hawk, North Carolina, making them the first men to pilot a heavier-than-air machine that took off on its own power, remained under control, and sustained flight. The early kite and glider experiments did not meet the performance goals which the brothers calculated before the flights. In late 1901, the brothers began to doubt the data which they were using to design their aircraft. They built a wind tunnel and developed model-testing techniques including a balance to more accurately determine the lift and drag of their aircraft. They tested over two hundred different wings and airfoil models to improve the performance of their gliders. Their very successful 1902 aircraft was based on their new data. Besides being airplane designers, and test engineers, the Wright Brothers were the first pilots of a heavier than air, powered aircraft. They developed their piloting skills by making over 1000 flights on a series of gliders at Kitty Hawk between 1900 and 1902. At the time of their first powered flight, the brothers were the most experienced pilots in the world. From 1903 to 1905, they continued to perfect their piloting skills on a series of powered aircraft. The Wright Brothers were the first to fly a self-propelled, heavier than air machine. This required the development of two other pieces of technology; a light weight motor and the propellers to push the aircraft through the air. The brothers based their engine design on an early internal combustion engine for an automobile. The thin, high speed propellers which they designed were based on wind tunnel tests and were unlike any other propellers being used at that time. While the design of the airframe of the Wright aircraft remained nearly the same for years, the brothers continually improved and upgraded their engine design. Between 1903 and 1913 the engine power increased from 12 horsepower to nearly 75 horsepower. It is important to note that the four flights of 1903 were only a chapter in the story of flight. The longest flight lasted less than a minute and did not include any maneuvers. The brothers continued to perfect their machine with a series of aircraft built between 1903 and 1905. They moved their flight testing from Kitty Hawk to their home town of Dayton, Ohio and flew their new aircraft at Huffman's Field on the edge of town. With new, more powerful aircraft, they were able to stay aloft for up to a half hour, to fly figure eights, and to even take passengers up for a ride. The age of the airplane had arrived.